The Item that is essential to success in college is purchasing your own laptop. This may seem like a no brainer, but it will play a key role in your success no matter your major. This nice things is that laptops now a days come in a variety of types and prices. 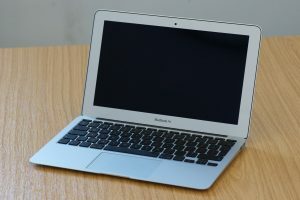 Personally I chose to get with a MacBook Air because I am more accustomed to Mac usage and I liked the how light the product was. The computer I use is shown below and you can purchase it from the DoIT Tech store here. You can also purchase the laptop at the Apple store or any other place that sells laptops. Having a computer is important for many different reasons. One is that you will most likely have to write some type of essay and turn it in electronically. Another is that you may want to take notes in class on your computer because the pace of different lectures can be quite fast. Lastly, having a computer and WiFi everywhere around campus means you will always have a wealth of information at your finger tips. Like I said there is many different laptop options a few other popular options are the Windows Surface, Or you can look into this Dell computer. Since there is so many options it is important to remember that they range in prices and it is possible to find a laptop in your price range.